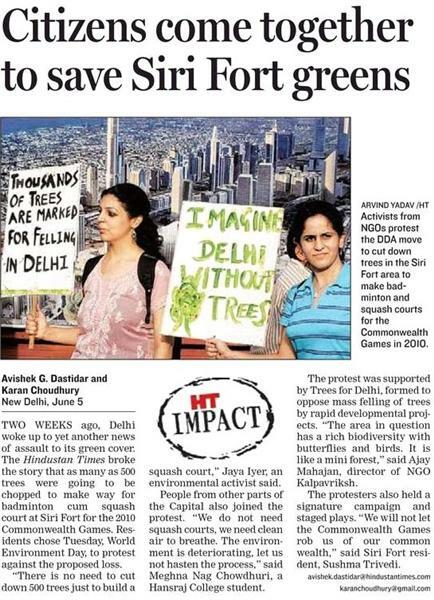 A lot of students, organisations, and local residents turned up for the ‘Trees For Delhi’ Protest against the felling of as many as 500 Trees, to make way for a squash court at Siri Fort for the 2010 Commonwealth Games. ‘Jungle’ Jaya giving a brief introduction about the proposed construction and tree massacre to all those who turned up for the protest. Lokesh can be seen in the vicinity. While some of the people did street acts, others went from car to car distributing pamphlets and collecting signatures. Still others shouted slogans and held posters and banners in order to inform general public about the damage being done. 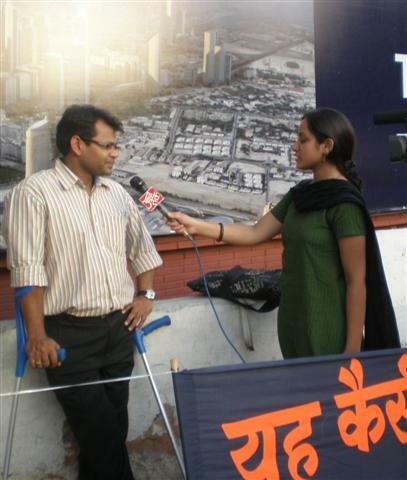 Mr. Parvinder Singh being interviewed by a reporter from AajTak. 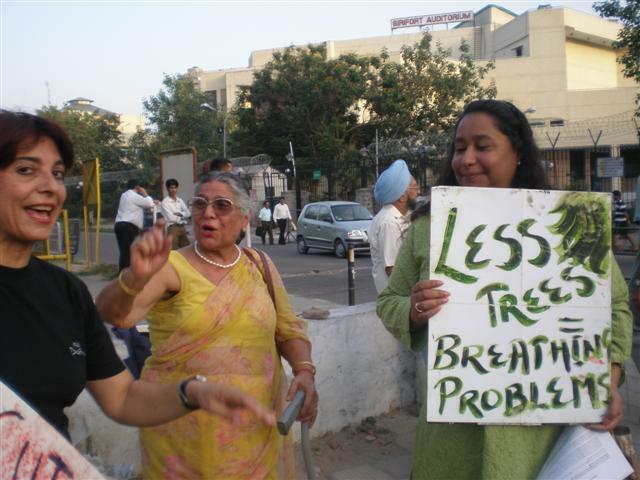 Local residents also joined in the protest to save their homes and their ambient environment. 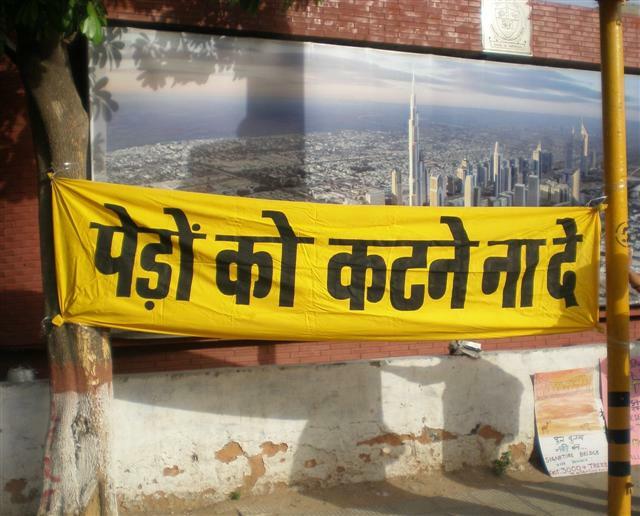 Another of the banners informing people about the so called ‘development’ that is planned for Delhi city. A signing campaign was also carried out and a petition was prepared and distributed to the people, drivers (during the Red Light), etc. and they were explained the destruction that is being “planned”. Almost all of the people who were approached, signed the petition. The following is a news clipping from HindustanTimes dated 6th, June 2007. NextThe Atmosphere is giving it back…. hello, i am a resident of the area and live very close to sirifort. i have seen the hcbs corridor but did not know of the tree cutting near my house. only came to know after seeing the protest yesterday. wil join in the next protest to save the trees. Good post Govind! Keep updating for good cause. I am forwarding this to other motivated groups as well…Regards. Development is important but not at the cost of the existing environment of Delhi. Mindless development like this will never work in th long run. Good luck with your campaign. Get celebrities on your side if possible! Good idea about getting celebrities involved if possible – it will give you wider publicity. Maybe it would help to get the petition going on the internet too. if anyone will save us, it’ll be pravah….!! People around my office want to cut the 35 years old Peepal tree which gives shelter to 20-25 old and poor people. The tree is at Shiv Chowk, Ranjit nagar, New delhi-8 outside shop no 8. @Manish Bhatia: Find out the reason why the tree is being cut. Is it for any particular reason? Is that reason really strong enough to cut the tree? Also try to find out whether those who are advocating the cutting of the tree have obtained the necessary permission or not. Inform them about legal action that may befall on them if they went ahead with cutting a tree without seeking permission, let them get entangled in the permission procedure. Since it is a peepal tree, you can also involve the temple near Shiv Chowk and inform them that a tree of religious significance should not be felled but preserved to as much extent possible.